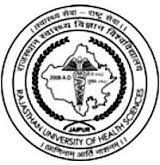 RUHS Recruitment 2017 – Apply for 684 Medical Officer Posts:- Rajasthan University of Health Sciences (RUHS), Jaipur has released latest notification for filling up 684 posts of Medical Officer. Desirous & eligible candidates can apply online from 17/11/2016 to 03/01/2017. Age Limit: Minimum 22 years and maximum 47 years as on 22/01/2017. Educational Qualification: MBBS and RMC registration is mandatory. Application Fee: Rs 5000/- (Rs 2500/- for SC, ST category of Rajasthan State). Starting Date of Online Application :17/11/2016. Last Date of Online Application : 03/01/2017. Last Date for Receipt of Hard Copy of Application : 10/01/2017. Tentative Date of Printing of Admit Card : 17/01/2017. On-line examination (computer based) at Jaipur : 22/01/2017. Application Procedure : Eligible candidates can apply online through the website http://www.ruhsraj.org from 17/11/2016 to 03/01/2017. Subscribe our free job alert mail for RUHS Recruitment 2017.